I knew there was something missing. 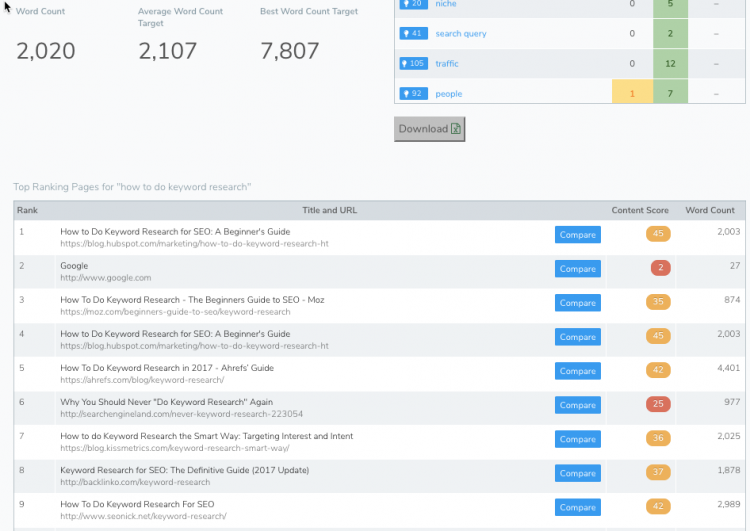 You do your keyword research, you optimize all on-page technical factors, and you wait. And you wait. Then finally you move from a poorly ranking position to a middling position somewhere meaningless on Google’s second page. Congratulations, you improved your click-through rate from .01% to .05%. And don’t you dare report a 500% increase. You’re frustrated and humbled. So what do you do? You could tinker with your content, I suppose. 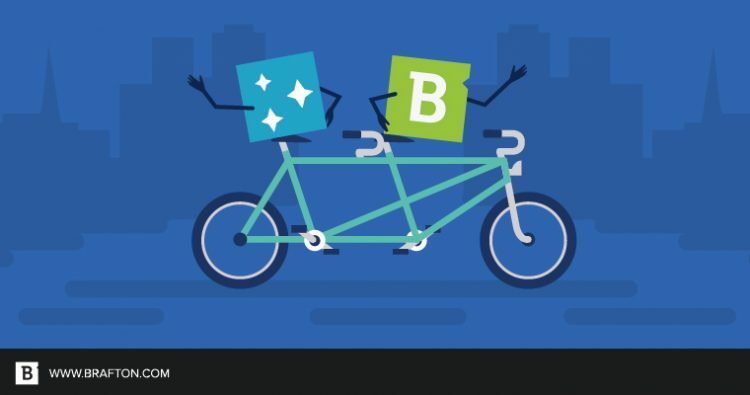 Searchmetrics will tell you the average word count for your ranking competitors, along with the keywords they use … but that’s superficial at best, and a blueprint for keyword stuffing. Moz doesn’t have anything that will help in this regard. Neither does SEMrush or Ahrefs. What we really need is an algorithm that understands the depth, quality and topics that are being discussed for the keyword you are targeting. We need an algorithm that mimics Hummingbird and gives us a blueprint for who we need to beat and how we need to beat them. These folks have built that very algorithm as a result of some Deep Blue-like data crunching. Eighteen fried servers, some sweat and a few tears (probably) later, they went to market with a tool called Content Analyzer. With this tool you enter the keyword you are trying to target along with the URL you’re attempting to rank for. It then generates a numerical output called a “Depth Score” which serves as the quality of your content relative to your competitors. The key word here (no pun intended) is “relative.” Some keywords are completely maxed out; unless you are going to write an epic tome that covers every question ever thought of, you aren’t going to rank. For example, I just completed a 2,000-word guide on how to do keyword research in 2017. It has a content score of 24. Not bad, but relative to the competition, I’m never cracking the first page. Our “depth score” is 25% lower than the average piece of content that ranks for this keyword, and more than 50% lower than the best piece. This helps you understand whether or not it’s worth your time to even write on a topic before you write it. Or, you can optimize existing pages, which is what we did. 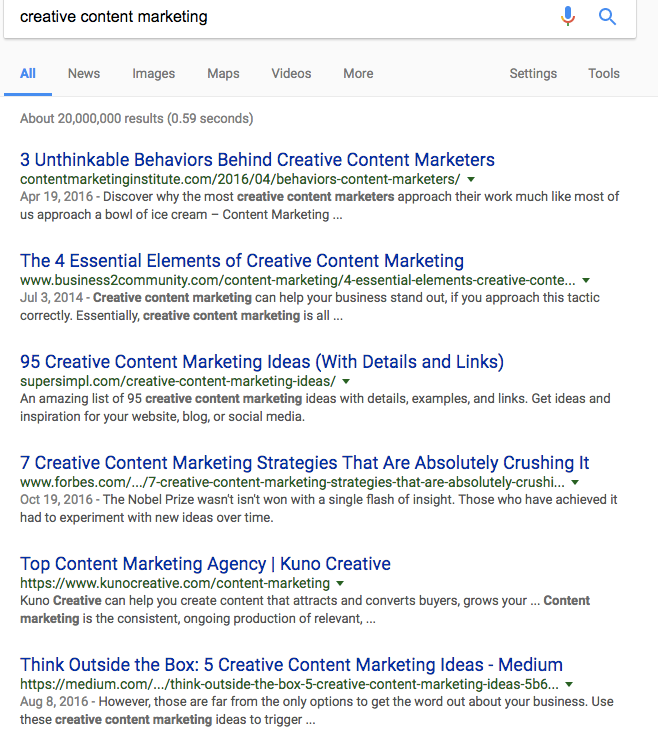 The problem with this keyword (other than the obvious) was that the intention of the searcher is ambiguous; they could either be learning how to do creative content marketing or shopping. And based on the SERP results, I’m inclined to believe it’s more the former than the latter. We swapped a keyword with little commercial intent for one with higher search volume, less SERP crowding, and undeniable commercial intent for no increase in organic difficulty. I’ll take it. 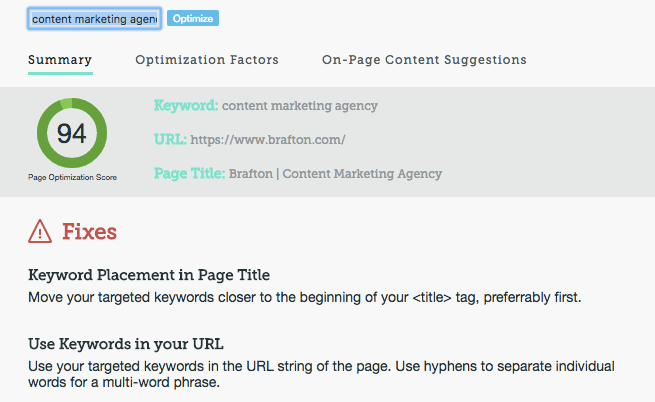 After determining this was our baby, I optimized all possible on-page factors for that keyword. Now we are getting somewhere. 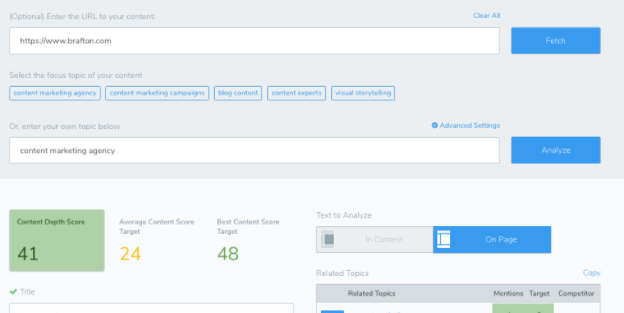 According to MarketMuse, our content has a depth score of 35. That’s not bad considering a relative average score of 24. However, there are major players in the top 10. 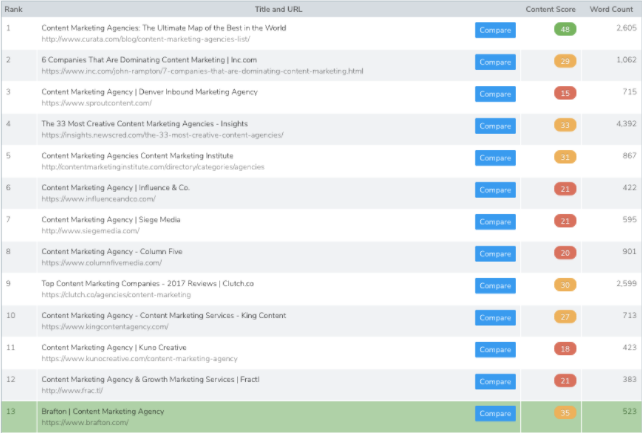 One must consider not just the content score, but the domain authority of these powerhouses. A 35 is just not going to cut it. So we did cut it. We rewrote the entire homepage, nearly doubling the word count and adding a variety of topics relative to our offerings and our space. We went live with the new page in the middle of April, and I did a Fetch as Google and submitted to index, then ran the page through the Content Analyzer once more. The result was a bump in our content depth score of six points (+17%). I waited, as we always do. A week went by, then … BAM! First page action. So how much does content depth matter in terms of ranking for your keywords? Turns out, quite a bit. By my estimation, on-page technical optimization generated a 19-38% boost, while content depth optimization generated an additional 300% increase in rankings. Not only did we increase our rankings for our targeted keyword, but as rising tides raise all ships, a handful of variant keywords came with it. *The ranking increases below do not isolate the Hummingbird algorithm, as we did in the case study above. These metrics are a reflection of both on-page optimization and content optimization, which as proven above, was a major factor. From now on, content depth analysis will be an absolutely irreplaceable step in our keyword research process. The numbers don’t lie.